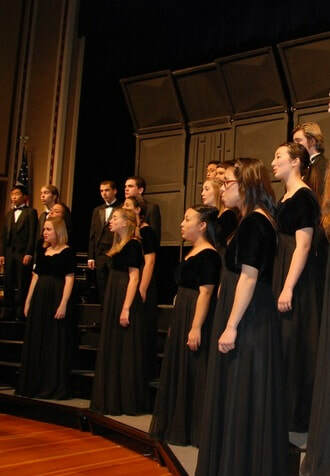 The Vintage High School Choral Music Department serves more than 150 talented teenaged students each year. We offer five choirs, ranging from entry level to advanced. Any student who wishes to sing can be part of the department. The Choral Music Department meets the high standards of the University of California fine arts requirement, and exposes students to the historical and cultural context of music from many cultures. Students are given a foundation for lifelong learning and develop an appreciation of some of the world's greatest music. In addition, the Choral Music Program provides a safe, supportive, and nurturing environment that fosters friendships, tolerance, and a challenging academic environment. As performers, our students represent Vintage High School to the community and to other youth, and are expected to act as role models. Our singers spend a significant amount of time rehearsing; our choirs participate in competitions, festivals, and tours within and outside of the United States as part of a well-rounded choral experience. Men's Choir is our entry level choir for boys. Beginning singers are introduced to principles of good choral technique, high-quality choral repertoire, and the thrill of performance. Men's Choir participates in three concerts in addition to several other performing opportunities throughout the year. With music ranging from classical to country to musical theater, there is a something for everyone! Women's Ensemble is our entry level choir for girls. Beginning singers enjoy learning principles of good choral technique, a more complex choral repertoire, and the fun of performing. Mixed Chorus is a popular way to start the day at Vintage. In this class, students have a fun and relaxing atmosphere centered around a constantly evolving repertoire of musical theater, classics, and contemporary music. Here, they learn the fundamentals of good choral singing while getting to know each other and learning to sing as a group and alone in a safe, trusting environment. Includes field trips and performances alone and with other choirs. This auditioned, male and female mixed choir exposes students to an increasingly advanced choral repertoire. Students sing in many languages, both accompanied and a capella. Additionally, the Concert Choir becomes the cast of our musical, which is produced every other year. Concert Choir students also have the opportunity to participate in tours and competitions. Chamber Singers is our most advanced ensemble. This audition-only choir features top-level choral repertoire, primarily a capella. Additionally, Chamber Singers spent a significant amount of time representing the Vintage High Choral program to the community and performing in several concerts and variety show performances each year. Singers are strongly encouraged to take voice lessons. Chambers Singers have traveled extensively in the United States and abroad, including Disneyland, Washington, D.C., Hawaii, New York, Italy, England, and Japan. This male and female intermediate choir requires a vocal evaluation. This class will sing lighter choral music, culminating in an optional spring semester field trip to Disneyland, where the choir hopes to perform after acceptance via audition and pending Board approval.